All around the world, savory pies encased in golden pastry are the ultimate hand-held comfort food. Each culture has its own tradition. In Russia, the piroshki is a ground beef and onion deep fried pie flavored with dill and served with sour cream on the side. In Turkey, the borek’s filling can comprise of spiced ground lamb or beef or a vegetarian filling and the pastry is more of a phyllo-type dough. 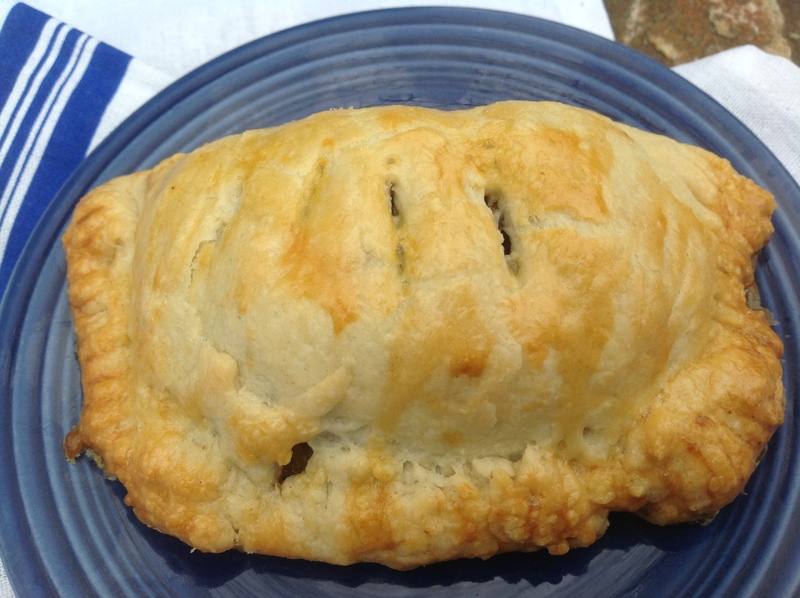 In England the Cornish pasty, a turnover in a half-moon shape, stufffed with minced or roughly cut beef with turnip, potato and onion has been around since the 14th Century and may be the original street food. Latin America has given us the empanada which varies from country to country: Argentina stuffs theirs with ground beef and olives while Chile showcases seafood in theirs. Their dough can be made from wheat or corn flour or even from plantain or sweet potatoes. The West Indies’ Jamaican patty has attained almost cult status. Its pastry boasts turmeric to give it its golden color and the filling is a spicy beef seasoned with Scotch bonnet peppers, curry powder and cumin although vegetarian or seafood versions are also popular. In India, the samosa is a triangular pastry stuffed with meat, fish or cheese and sometimes spiced potatoes and veggies. In culturally-rich Canada, many of these hand held pastries from around the world are on menus everywhere. I never, however, encountered the beloved tourtière of French Canadian culinary heritage offered in a hand held size. Recently, while in a marathon session in the kitchen preparing home-cooked meals to send to one of my sons, I was inspired to create our family’s traditional meat pies in individual portions for ease of travel and in a size to feed a single guy, not a whole family. 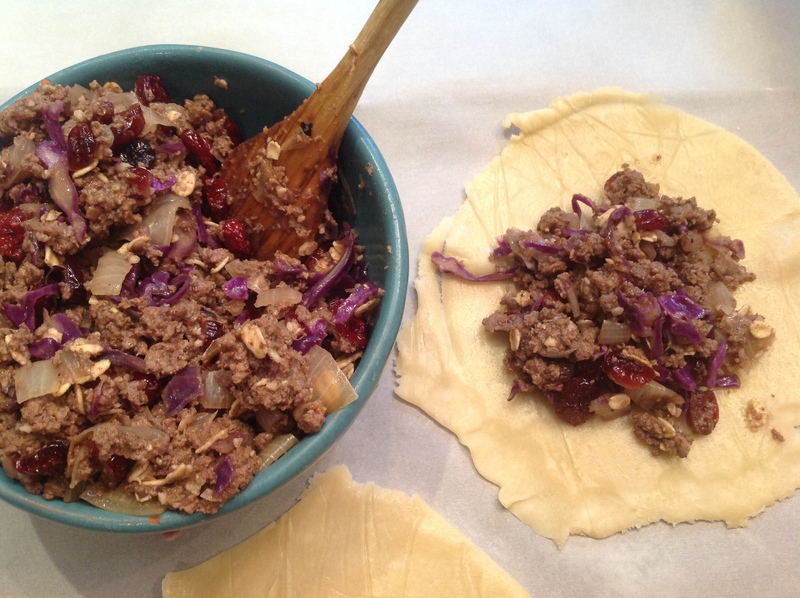 I substituted the pork for ground turkey and added shredded cabbage and dried cranberries to my maman’s classic tourtière recipe, with all its fragrant spices enveloping a golden, flaky half round pastry crust. And oh my, the result was totally mouth-watering and so adorable in its mini size, a practical adaptation of a family favorite. Then I read an article on hand pies from around the world in the current issue of The Canadian Living Magazine and realized there were NO Canadian savory meat pies featured. 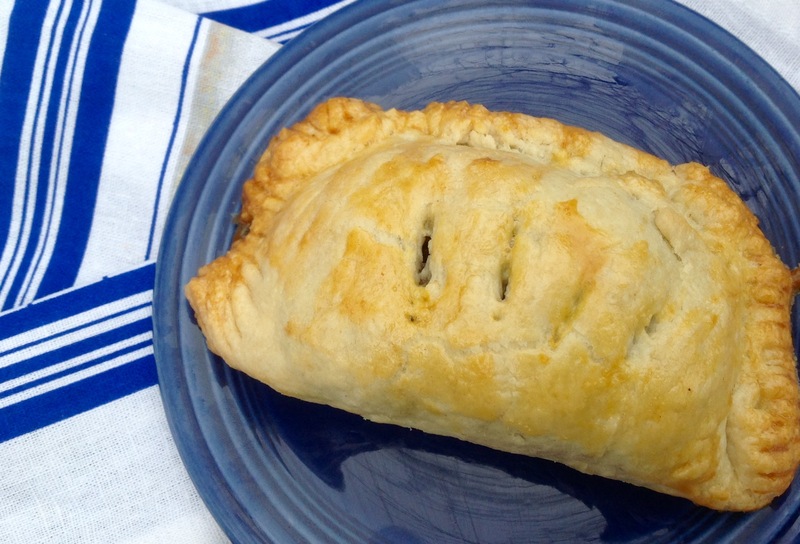 Who knows, maybe I’ve just created the Canadian cultural offering to the world of savory hand-pies? From Canada, with love! Preheat oven to 400F and line a baking sheet wiht parchment paper. In a saucepan, brown the turkey and onion. Season with the spices and the salt and pepper. 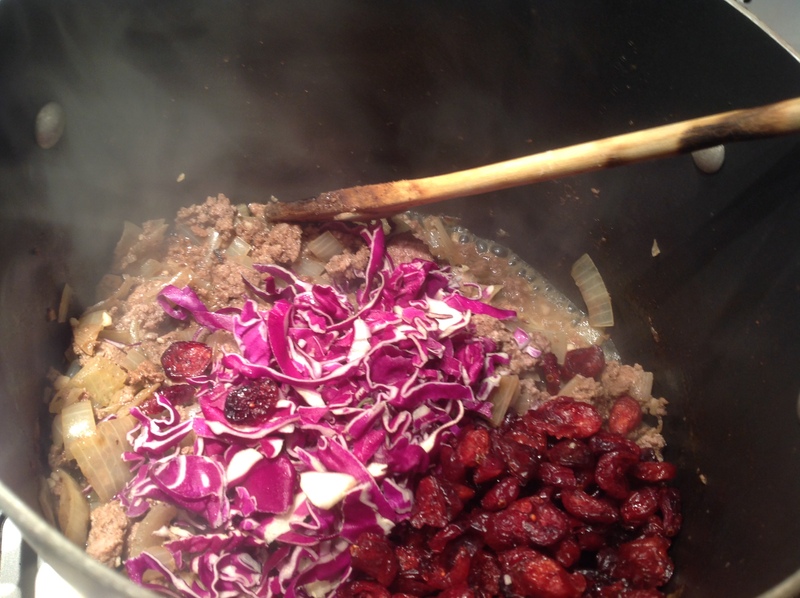 Add water, cranberries and cabbage and continue cooking for about 10 minutes. Add the oats to bind the mixture. Let cool a bit before handling. On a floured surface, roll out your dough. 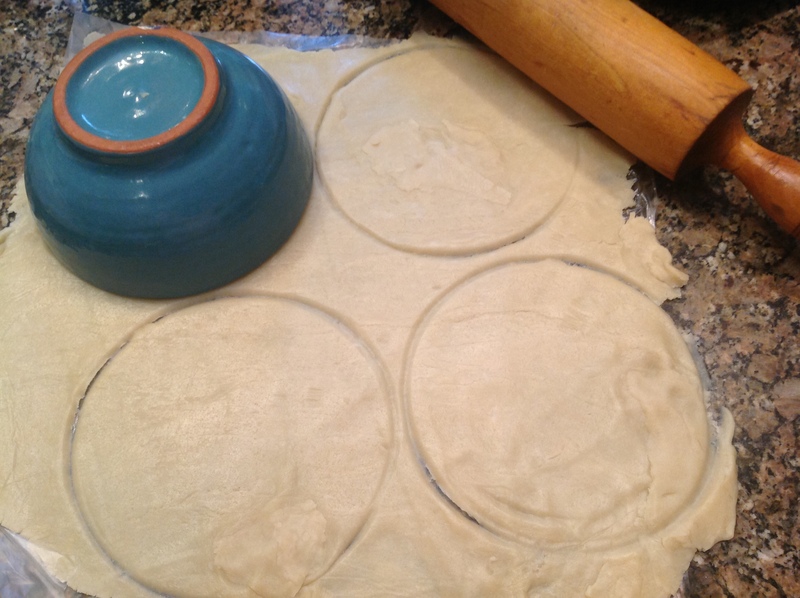 Using a 5″ in diameter inverted bowl, press down on your dough to mark up to 8 circles. Use a knife to go over the marks and release the forms. Line a baking sheet with parchment paper. Transfer one dough circle onto to the baking sheet at a time as you work to fill each handpie. 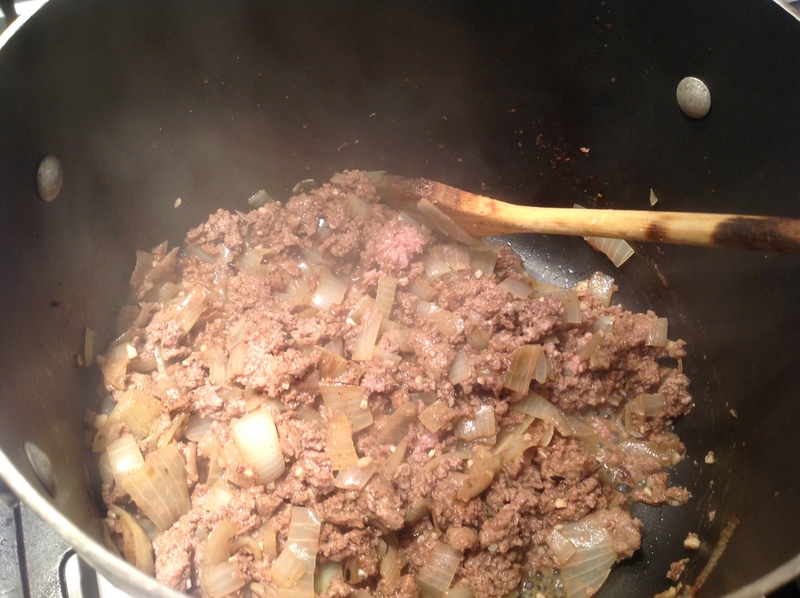 Mound about 1/4 cup of meat mixture in the center of the pastry. Fold over the dough, using a fork to push in the filling as you seal the pastry pocket. Use the fork to crimp the pastry edges. You will have some left over filling and ends of pie crust. Join the dough ends and reroll to create another tart with the extra filling. You should end up with 8 or 9 hand pies. Brush the pastry with thin egg wash. Cut a few venting slits on the top of the pies. Bake in the center of the oven for about 20-25 minutes, until golden. Cool 10 minutes before eating. Can be frozen and reheated. Source: February 2017 issue of the Canadian Living Magazine. 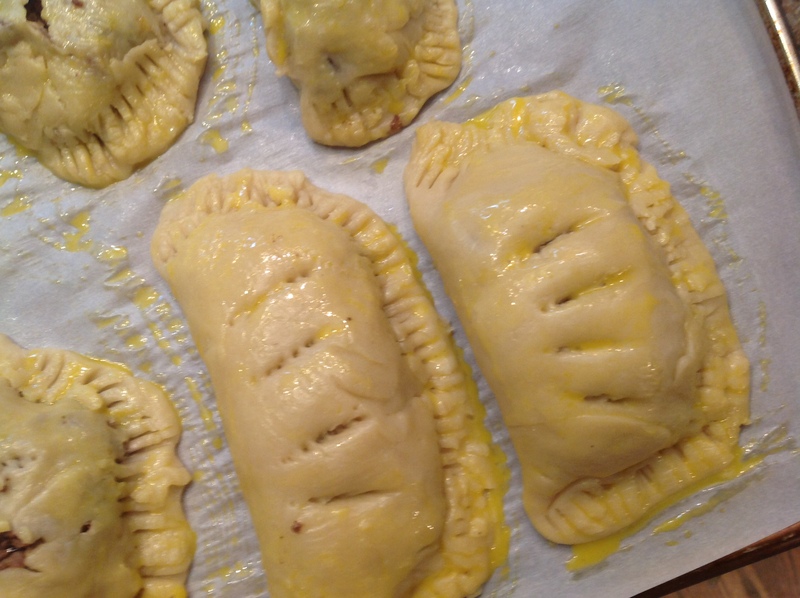 This entry was posted in Recipes and tagged homemade hot pockets, Individual meatpies, individual turkey pies, savory handpies, savory personal pies, turkey hot pockets, turkey mini pies by Johanne Lamarche. Bookmark the permalink. You are the first cook that has mentioned Turkish Borek! I learned to make this many years ago from a friend form Turkey. Her recipe is like ravioli. I enjoyed borek at my Turkish friend’s home and in Istanbul. It is delicious. Maybe you should share your recipe with us! I have not made it myself though but love all Turkish food! It’s a recipe that I think about making for my blog. Vegetarian, but very nice. I have the right spice for it too. Hmmm. I love your intro, I always say that every cuisine shares so many of the same dishes, what defines them are cultural differences in flavours and ingredients 🙂 I’m sure your pies were very happily received! Your words resonate with me Elaine, especially in the current political climate. Food unites cultures and lets diversity shine, rather than divide. I really enjoyed the cultural history of the hand pie Johanne, I think it’s fascinating how food is such an intregal part of the traditions and lifestyles of different countries and regions. I have no doubt that your turkey and cranberry hand pies are divine! You have me wishing for one right now! Food unites us and enriches us culturally. It would be so wonderful is we could solve some of the world’s conflicts with food woudn’t? I wish I could share a handpie with you Jenna! I had fun making these and so excited to send them to my son. 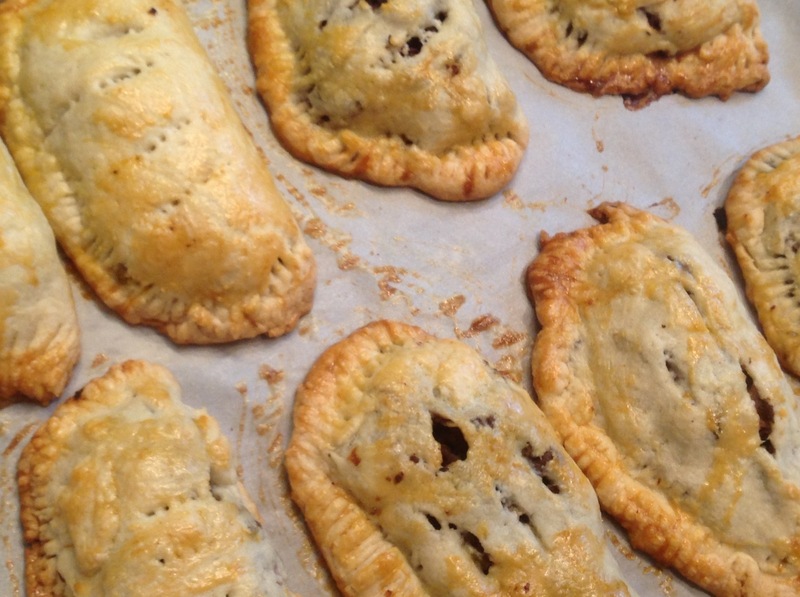 What a great introduction to the infamous hand pies from around the world Johanne. I make something similar in either vegetarian or ground turkey which we call “patties” – I think I featured it on my blog once. But tourtiere oh my, now you have me salivating. You really have a wonderful way with words and descriptions, love reading the information you provide too. After researching savory hand pies around the world from the Canadian Living article, I wondered why we never thought of tourtières this way! I only sampled the meat for spices and sent all of them to my son but he said they are really good. I will make them again. I have seen them referred to as hand pies. They are universally delicious in all variations! Looks so good, Johanna! Yum! Thanks Mollie! I always think of you when I make meat pies now :))). lol, I still haven’t made mine, but I think of you and your Mom every time I see a post for one! Aw Johanne – imagine – this is how I get my Canadian Living: via your Pennsylvania blog! Fantastic. I love these little pies. How perfect. Always a Canadian at heart no matter that life has taken me to PA. I can’t believe it never occured to me to make mini tourtières before! I may be back to Canada sooner than planned if this president keeps up his shananigans!!!!!!!!!! 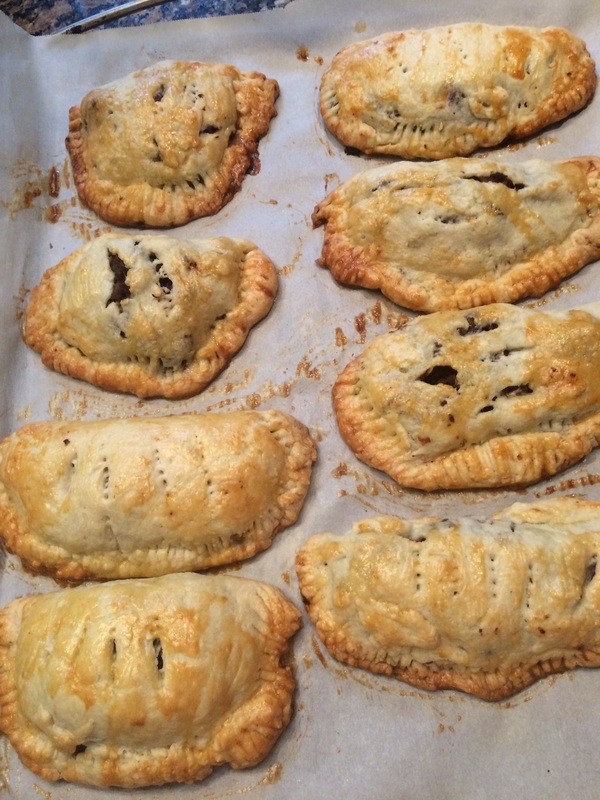 A warm hand pie on a cold day…what could be better! Happy mid-February Johanne. Agree, Teresa! I hope there is a perfect little hand pie to warm up your February too!